Klaptraps (also spelled Klap Traps or Klap-Traps) are Kremlings that originated in Donkey Kong Country. They are small, four-legged crocodilians with large mouths, hence their name. They cannot be defeated by a front attack, but they are vulnerable to a stomp. They come in blue, red, purple, and green varieties. 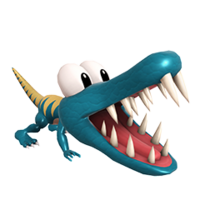 Klaptraps may be based off Snapjaws, crocodilian enemies Mario would send after Donkey Kong Jr. in the game Donkey Kong Jr. In their debut game, Donkey Kong Country, the regular blue Klaptraps are common enemies that can be easily avoided. They even pass harmlessly under Expresso the Ostrich's tall legs, allowing the Kongs to avoid them entirely when riding their Animal Friend. Purple Klaptraps also appear rather frequently on the stage Loopy Lights, and also in a bonus level in the stage Trick Track Trek. These Klaptraps will always jump at the same time that the Kongs try to jump, which makes them more dangerous than the normal blue Klaptrap. In the Game Boy Color version, they are brown, and in the Game Boy Advance remake, they are red. Klaptraps do not appear in Donkey Kong Country 2: Diddy's Kong Quest and Donkey Kong Country 3: Dixie Kong's Double Trouble!, instead being replaced by their relatives, Klampon and Krimp, respectively. Klaptraps later appear in Donkey Kong Country's semi-sequel Donkey Kong Land. Klaptraps are relatively unchanged in this appearance aside from being monochromatic due to the Game Boy's graphical limitations. After several years of absence, Klaptraps return in Donkey Kong 64, where they are given a new ability. Once a Klaptrap is defeated, its set of teeth will continually attack the Kongs until they break. The teeth will not attack the Kongs if an Orange or a musical instrument was used to defeat the Klaptrap. The teeth will also break upon falling into water. Purple Klaptraps make a reappearance and are slightly larger than the Kongs. They are immune to all of the Kongs' attacks (even the shockwave attack), but can be defeated with an Orange or a musical instrument. Some of Donkey Kong 64's cutscenes show King K. Rool with a small Klaptrap that seems to be his pet. Red Klaptraps can also be seen in two cutscenes, and a giant red one was sent by King K. Rool to execute a Kasplat. Also in Donkey Kong 64, a Klaptrap is playable in the minigame Beaver Bother; this marks the first time a Klaptrap is playable. An individual Klap Trap appears as an antagonist in the Donkey Kong Country novel. An employee of the Kremling factory, Klap Trap has a small chat with his coworker Zinger about King K. Rool's absence at the site and he then notices that the Kongs are eavesdropping on them. Klap Trap lunges at the group, but Diddy Kong defeats him by doing a cartwheel. The Kongs destroy the factory shortly after. In the novel Donkey Kong Country: Rumble in the Jungle, while looking for a replacement part for Funky Kong's barrel plane, Diddy Kong encounters a Klap Trap within the Kremlings' supply room. Diddy Kong immediately tries to attack the Klap Trap, however it quickly evades all of his attacks, causing Diddy to crash into a storage shelf. 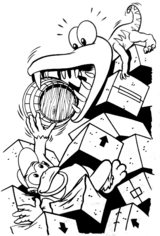 Diddy manages to lodge a barrel in the Klap Trap's jaws while it was charging towards him, allowing Diddy time to escape the store room with the water pump. In the Donkey Kong Country animated series Klaptraps are, instead of soldiers, ammunition for a weapon called a Klap-Blaster. Unlike the Klaptraps of the games, the ones on the show are capable of speaking. Often times when a Klaptrap is seen, it makes a sarcastic comment about its job or what it had just eaten. 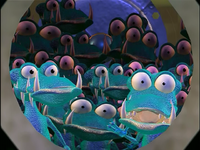 The show also features a singular Klaptrap character larger than his brethren. In Super Smash Bros. Melee, Klaptraps appear in Donkey Kong's stages, Kongo Jungle and Jungle Japes. They swim through the water rapid and leap out of it in an attempt to bash characters to their doom; they can also fall into, occupy, and use the Barrel Cannon on the former stage. Since Jungle Japes returns in Super Smash Bros. Brawl and Super Smash Bros. for Nintendo 3DS, Klaptraps reprise their roles. Klaptraps also reappear in Super Smash Bros. Ultimate, as both stages return in that game. The Klaptraps on the Kongo Jungle stage are colored orange, while those on Jungle Japes are blue. In Super Smash Bros. Ultimate, a Klaptrap also appears as the first and only Assist Trophy from the Donkey Kong series, where it lunges and bites on to opponents. If they are hit, they make the same sound they did when they were defeated in Donkey Kong Country. One additionally appears as an Advanced Attack spirit. The latter must be unlocked by playing Classic mode with King K. Rool and reaching the goal of the bonus stage within 45 seconds. Klaptraps also make minor appearances in Donkey Konga. Klaptraps appear in Mario Power Tennis in Donkey Kong's Jungle Court. They try to bite the player, causing the player to slow down. Klaptraps also appear in the minigame Balloon Panic. Here, the player must protect several balloons from hungry Klaptraps. Klaptraps are distractions in Donkey Kong's course in Mario Superstar Baseball. Klatraps try to bite the outfielder's heels, slowing them down. However, if the player were to hit the baseball into a Klaptrap's mouth, it will give the player a Team Star. Klaptraps make a cameo in Mario Party 7 as enemies in one of the Pyramid Park events. If they bite a player, they will lose some of their coins. 11/94 This low-slung alligator made its first appearance in Donkey Kong Country. You can subdue it by jumping on its back, but its powerful jaws make it dangerous to approach from the front. In Super Smash Bros. Melee, it swims in the river and sometimes jumps in the Barrel Cannon to stop players from using it. ↑ Donkey Kong 64 instruction booklet, page 4. ↑ Donkey Kong Country instruction booklet, page 28. ↑ Donkey Kong Country Player's Guide, page 13. This page was last edited on March 30, 2019, at 12:47.